Tartak is on course for a third consecutive outing at Cheltenham as his trainer Tim Vaughan eyes a tilt at the £50,000 Grade Three New Year’s Day Handicap Chase, the highlight of an exciting seven-race card on New Year’s Day, Tuesday, January 1, 2013. The nine-year-old won the two mile, five furlong contest in 2011 when in the care of Tom George and has performed admirably at Cheltenham this season, finishing sixth in the betvictor.com Handicap Chase on his seasonal reappearance at The Showcase in October and fourth in the Paul Stewart IronSpine Charity Challenge Gold Cup at The International on December 15. 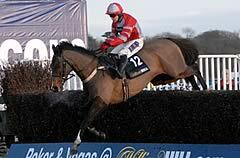 Vaughan said: “Tartak has come out of his recent start at Cheltenham fantastically well. He had a quiet couple of days but enjoyed his first stretch this morning up the canter and the New Year’s Day Handicap Chase is the target. I am looking forward to it because his run on Saturday will have brought him on a little bit. “Since he arrived with us he was fifth at The Festival, sixth on his reappearance and fourth at the weekend, and as a result he is becoming very well handicapped. Hopefully, one day everything will come right for him and we will be able to get a nice win into him. The action on New Year’s Day at the home of Jump racing could feature a mouth-watering clash between dual Grade One winner Oscar Whisky and 2011 Stan James Champion Hurdle runner-up Peddlers Cross in the £25,000 Cheltenham & Three Counties Race Club Hurdle (3.05pm) over an extended two and a half miles. Racing gets underway at 12.15pm and also includes the Grade Two Cheltenham Pony Club Raceday Novices’ Chase (1.20pm) over an extended two and a half miles. The £32,000 contest witnessed a superb front-running performance from Champion Court last season, who went on to finish second behind Sir Des Champs at The Festival, while past winners also include subsequent Grade One scorers My Way De Solzen and The Listener. A large crowd is expected to welcome in the New Year at Cheltenham Racecourse. The advice for those racegoers intending to buy tickets on the day is please arrive early or, even better, buy online using print@home and save money as well as time. The price for the combined Club/Tattersalls Enclosure is £25 if bought online using print@home, even on the morning of New Year’s Day, as against £30 for those purchasing on the day at the racecourse. Racegoers aged under 18 are admitted FREE, while FREE car parking is also available.